Recently converted lover of winter weddings here. All the coziness and warmth and joy - when it’s cold outside and there’s candlelight inside, and it’s just so romantic. This wedding at Ann Arbor’s Cobblestone Farm and reception at Weber’s was just gorgeous and an honor to be a part of. 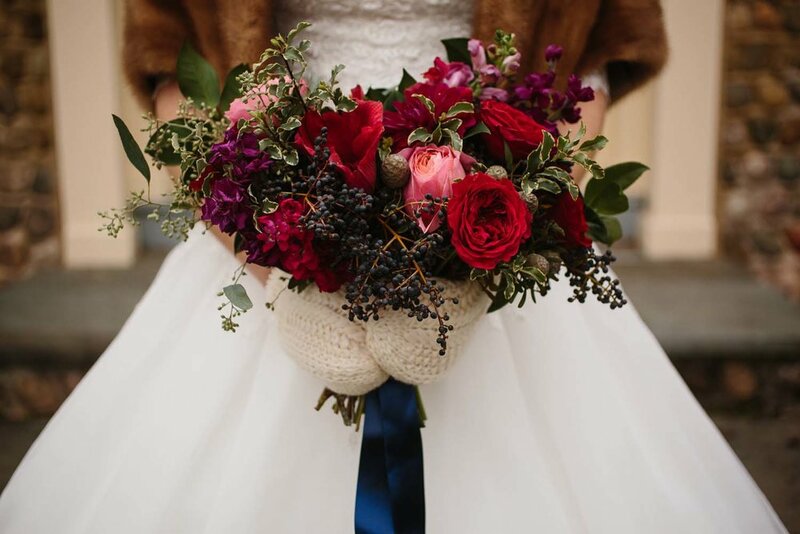 I loved this lush color palette of jewel toned cranberry, amethyst purple, navy blue, reds, and lots of textured foliages. So thrilled to share these beautiful images with you from Matt + Ashley Photography. Happy summer! It's the busiest time of the year for designing wedding flowers, so there's not as much time to blog and post, but I wanted to add these beautiful pictures from Kathleen and Jason's gorgeous summer wedding last year at St. Joseph's Catholic Church in Dexter and Webers in Ann Arbor. It's the perfect feel of summer! Lush greens and white and ivory blooms, and a gorgeous natural shaped bouquet. And pretty compote centerpieces added a perfect accent of gold. It was a perfectly joyful celebration! Thank you to always-fantastic Melanie Reyes Photography for these beautiful images!